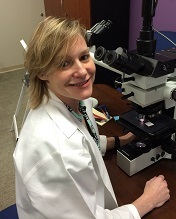 Dr. Shelly Frazier is a board certified Anatomic and Clinical pathologist. She practices Surgical Pathology with emphasis in Gastrointestinal and Hepatobiliary Pathology at University of Missouri-Columbia, where she also serves as the Student Pathology Course Director, Co-director of Surgical Pathology, and Associate Pathology Residency Program Director. While her primary area of clinical practice is Surgical Pathology, her residency training and board certification in Clinical Pathology give her beneficial experience in specimen drug testing (one branch of Clinical Pathology). Frazier is a lifetime athlete having played four sports in high school and Varsity Softball and Club Rugby in College. She also has competed in several triathlons and road races of all distances beginning in medical school. Her endurance sport accomplishments include qualifying for, and competing in, the Boston Marathon twice, and completing a North Face Endurance Challenge 50K Ultramarathon in 2011. Frazier began using strength training to augment sports performance as far back as high-school, but only began consistently powerlifting for sport after competing in her first ADFPF event in 2009 at the age of 38. Since then she has earned multiple world records in bench press and deadlift in the WDFPF and was awarded “Best Lifter” in the Bench Press Competition at the WDFPF Single Event World Championships in 2015. Frazier has a strong commitment to drug-free, well-rounded fitness, including both endurance and strength training. However she now limits her endurance competitions to half-marathon distance or shorter races since undergoing a partial knee replacement in 2014.